A wine made with love and passion produces an emotion...You can find in a wine the personality and character of those who made it because each gesture, each operation, each decision has its importance. The "life force" is so well constructed that if we speak of natural wines, you will not find two wines that are the same anywhere in the world, as opposed to industrial wines which are all similar. The industrialization of wine is the end of its identities, its nuances, its characteristics which are part of the magic of a bottle. The work we do at our domaine, it is, in a way, the summary of all that. Exceptional terroirs like Les Bruyeres, La Mailloche, En Barberon, Curon. An attempt to achieve the maximum expression of those terroirs: our 35 hectares of vineyards are cultivated in bio-dynamic viticulture to allow the soils to live, to have grapes untouched by chemical products, to allow natural yeast fermentations, to reduce the doses of sulfur in the cellar. 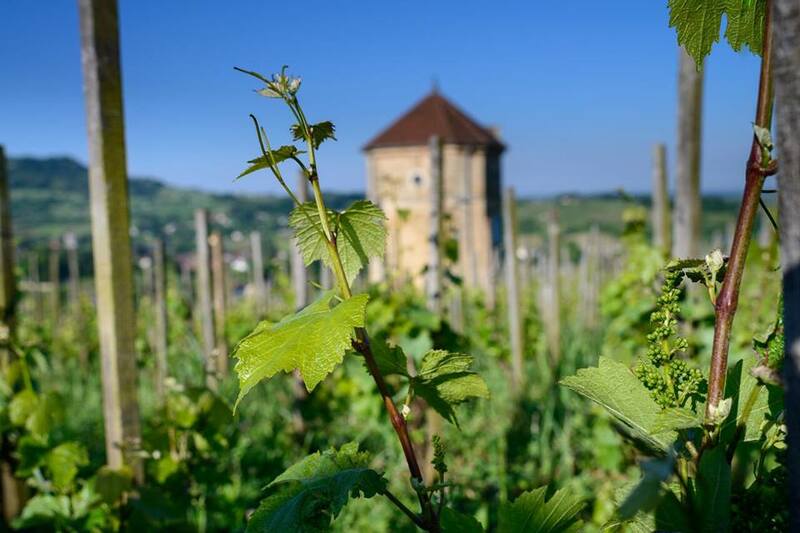 This quest for aromatic diversity has lead us to produce 28 different cuvees, often terroir by terroir, with lots of innovations which take into account the incredible diversity of the vineyards of the Jura. The way we work requires lots of effort on the part of our team. 15 people work full time all year long aided by several students int eh summer and in September, by 50 harvesters. Finally, we have many new projects, from the creation of new cuvees to replanting vineyards like the Clos de la Tour de Curon, without forgetting our desire to constantly increase the quality of the wines which is our principal motivation.